In this article we will show some distinguishing features, that will make your Guru Maps experience easier and more complete. 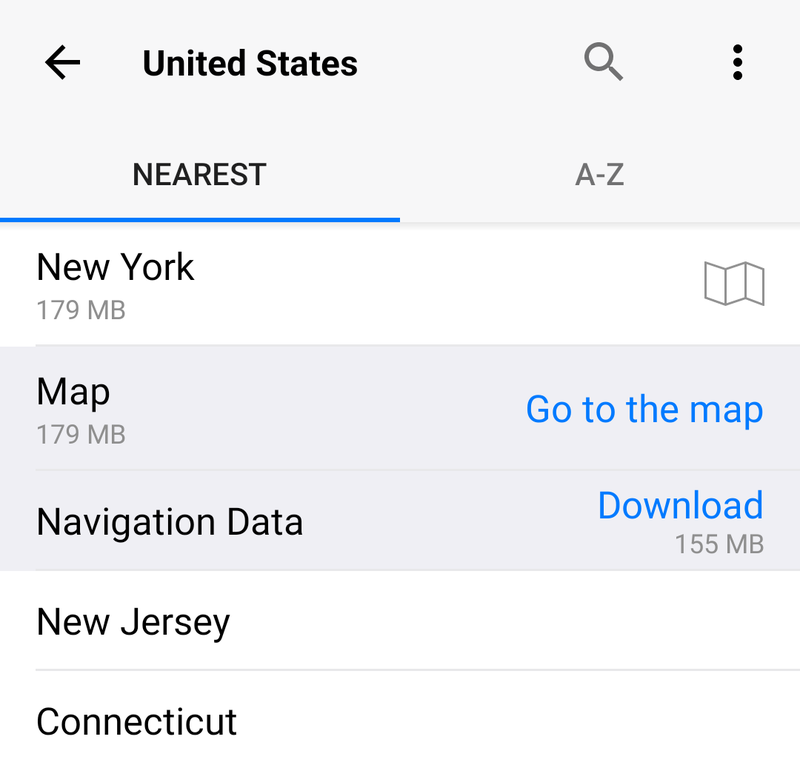 To remove a map swipe your finger across the country name from right to left, then tap the Delete button, or use the Edit button. 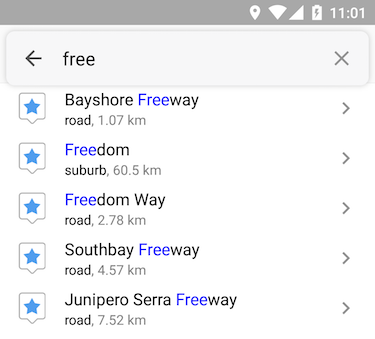 The app lets you search within My Collections content as well as map OpenStreetMap.org data. To open the search screen, tap the search button. Type or paste the word you want to find in the search field. Search results will be displayed on the map and in the list below the search field. 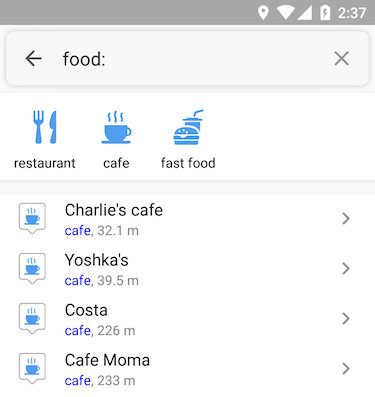 It is also possible to narrow down your search using the “Search around me” option at the bottom. 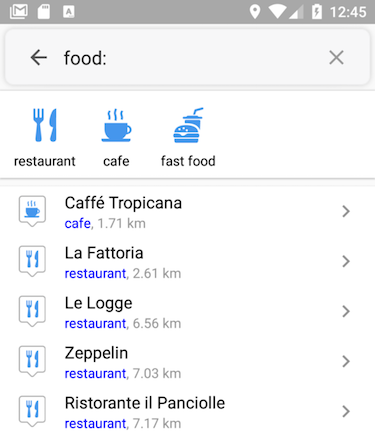 Tap an any of the results in the list to open its entry or back to the map to overview them all. The search will be refined as you browse the map automatically and only results meeting the selected search criteria will be displayed in the visible area. If search results are found, the search icon will be changed to the . To reset search results, tap the clear icon. Voice Search: You can use your voice to perform a search instead of typing when you&apos;re connected to the Internet. Just tap the search field, and then tap the microphone icon to start dictating. When you’re finished, wait for your words to be processed. It can take a few seconds for text to appear. 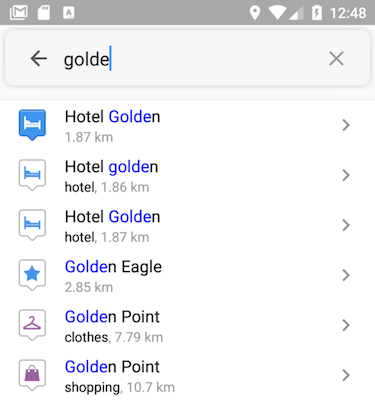 Note: The App makes searching within the downloaded offline maps and only places which are mapped within OpenStreetMap can be found and displayed. by address (internet connection required). Tip: It is not necessary to type punctuation or worry about capital letters, but the search will not recognize a misspelling. Tip: You may enter the coordinates in any of the supported coordinate formats. To avoid confusion while inputting coordinates from the keyboard it is possible to use spaces instead of (‘) Right Single Quotation Mark, (”) Right Double Quotation Mark or (°) Degree Sign. To view more address and contact information, tap the desired result in the list. To save search result to your collections, tap icon at the bottom of details screen. Guru Maps gives you the ability to find the best route and get step by step directions for your drive or walk. Note: to build a route offline you need to download navigation data first. 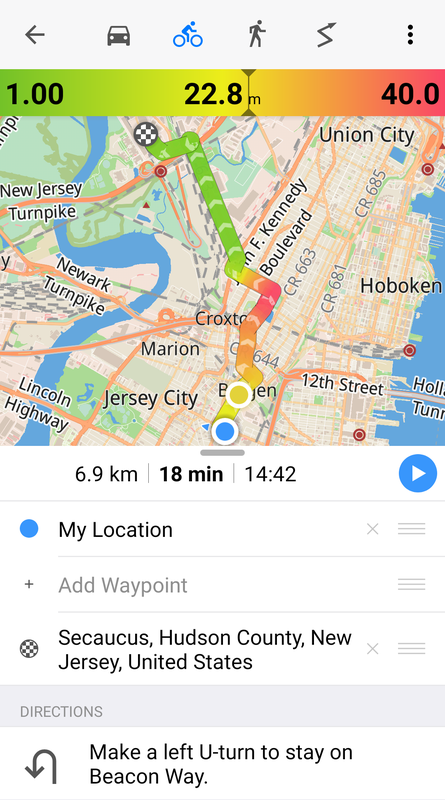 To get started with the route planner feature, define the place you want to go first, long tap the destination point on the map, then tap icon from the pop-up menu. swipe right on a bookmark in My Collections or search results list, then tap . Note: The point on the track is related to the speed and altitude values. To begin navigation, tap icon. To stop your route, tap icon, then Stop movement option from a menu. If you miss a turn or intentionally go the wrong way from the planned route, the app will automatically recalculate the route. — for transit points, — for stop points. When you’re navigating to a place, you can hear navigation directions. You can stop receiving directions at any time while in navigation mode by tapping the sound icon . A long tap on the sound icon allows choosing one of the supported languages, which will be used for voice instructions. You can also change the language selection to hear the navigation instructions in the app Settings > Navigation. You can easily import KML/KMZ/GPX files to view them on the map in several ways using email, URL or Files app. Open the message containing the KML/KMZ/GPX file as an attachment. Tap and hold the attached KML/KMZ/GPX file name until a menu comes up. Choose the "Open with Guru Maps" option to initiate the file import process. 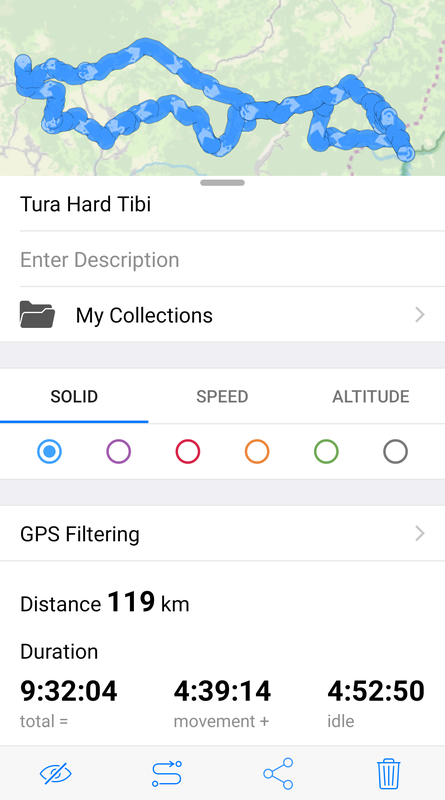 If you saved KML/KMZ/GPX file on your device storage or inserted SD Card with some KML/KMZ/GPX files, you can add it to your Collections in Guru Maps by clicking on them from any of installed file managers on your device. Tap the link to open it in your browser. Select "Guru Maps" option to initiate the import process. Tap the icon on details screen. 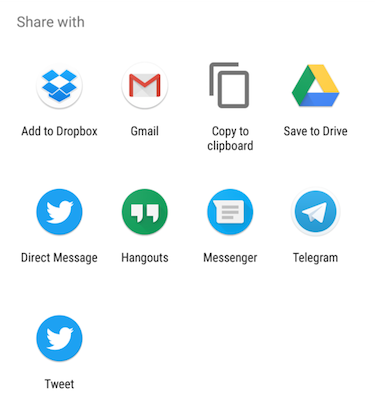 Tap "Save as KML", "Save as GPX", "Share URL" button. The Bookmarks feature is a great way to keep your favorite places at your fingertips. Save places you want to go to or mark an interesting POI on the go that you could come back to later. To move the bookmark tap the bookmark icon and hold for a second, then drag the bookmark to where you want and drop it. 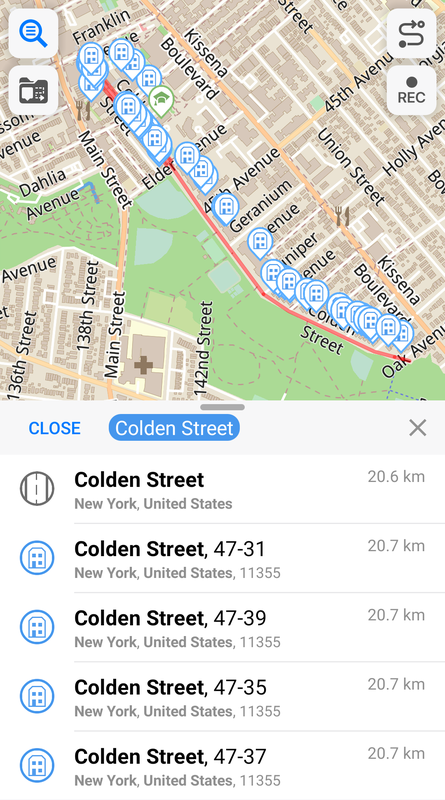 To view bookmark details tap the popup with button next to the bookmark name on the map or open it from the My Collections list. 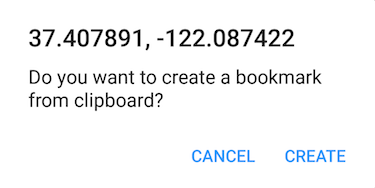 To edit bookmark name and description tap the name or description field and use the onscreen keyboard to type a new text. 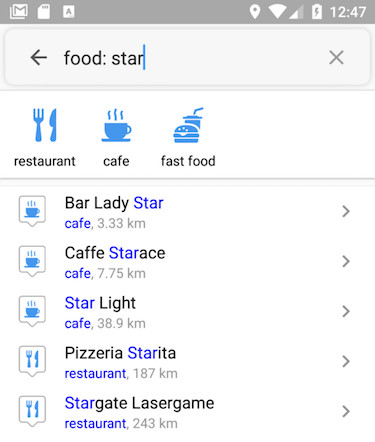 To change the bookmark icon tap the Category field and select the icon you want from the list with available icons that will open, then tap Back. 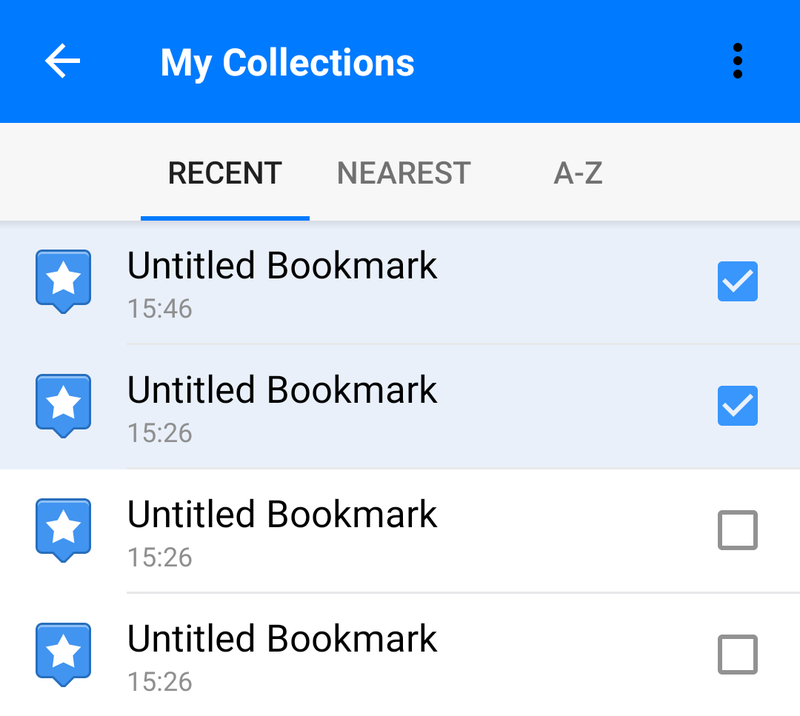 To move a bookmark to another collection tap the field with the collection name and select the new name from the list of available collections, then tap Back. Copy as text — coordinates will be copied to the clipboard in the format as you see it (+9.570674, +100.060448). Copy as URL — coordinates will be copied as URL, containing geolocation information (latitude, longitude, zoom level) of a selected bookmark to share it by Email or SMS (guru://9.570674,100.060446,16.0). Tap this URL from the email or message on your device to view the location on the map within the installed Guru Maps app. 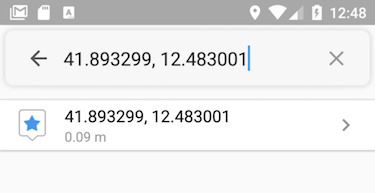 To edit coordinates, tap the coordinates to start edit (X ,Y) GPS coordinates. Note: The bearing line to only one bookmark can be displayed on the map at any given moment. To view the bookmark on the map tap the icon to open the map centered on the selected bookmark. 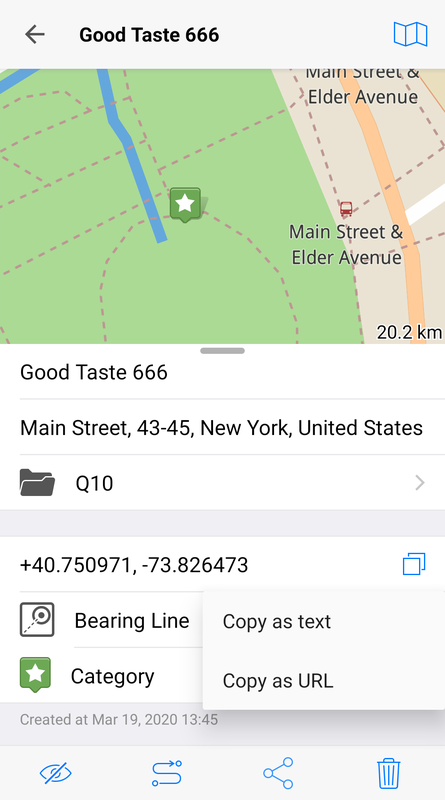 To hide the bookmark from the map, scroll down the bookmark details screen and tap icon. To reveal it again, tap icon. To create a route to this bookmark, tap icon. To delete a bookmark, tap icon at the bottom of the bookmark details screen. Tip: The best way to export several bookmarks at once is to save them in one collection and export the whole collection. Guru Maps lets you record your movements, view detailed statistics and export recorded GPS tracks in most common formats. To record GPS Track, tap the REC button on the map. It will become red. If you recorded track before, you will be prompted to continue the last track recording, or to start a new one. Tap the REC button again and the recording stops. — track is recording now. Note: to record GPS tracks in background, make sure you have disabled Battery Saver in device settings. To view track details tap the icon next to the track name on the map or open it from the My Collections list. 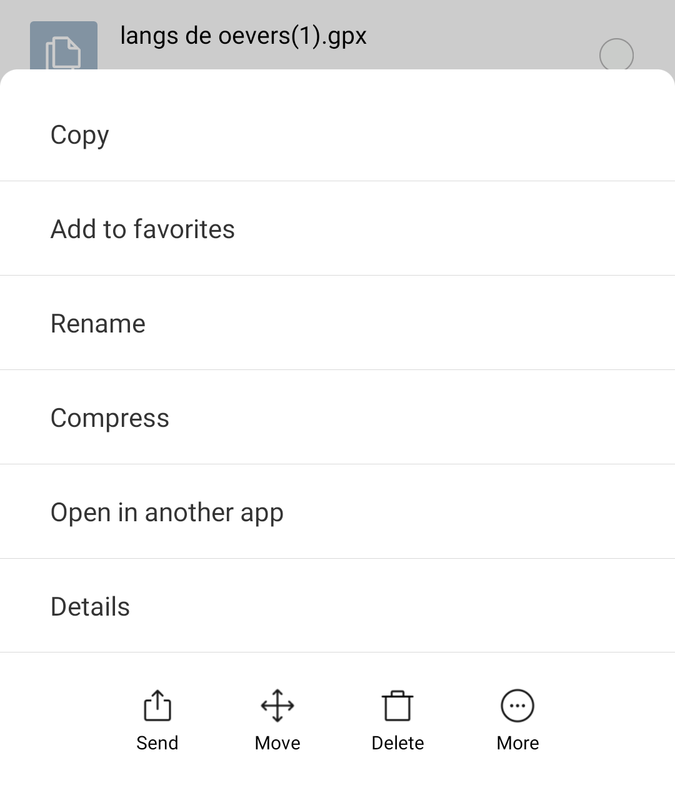 To edit track name and description tap the name or description field and use the onscreen keyboard to type a new text. 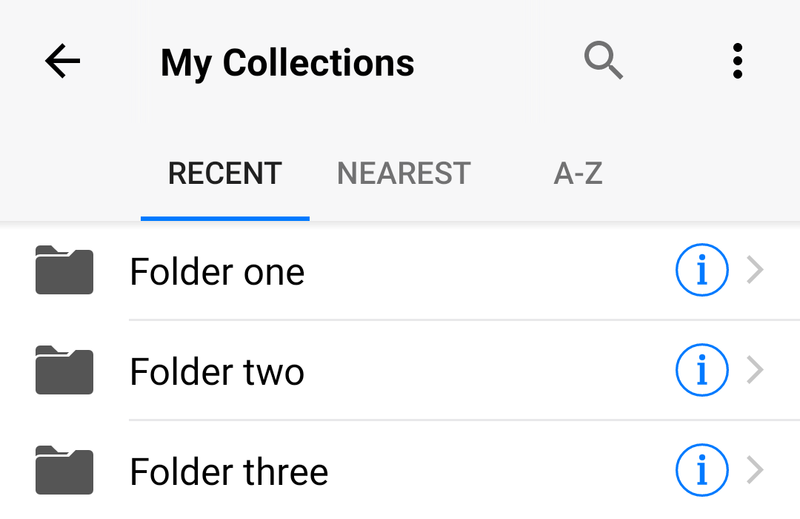 To move a track to another collection tap the field with the collection name and select the new name from the list of available collections, then tap Back. To change track style tap the desired color or set the track color based on speed or altitude. To view track on the map tap icon to open the map centered on the selected GPS track. To hide a track from the map scroll down the track details screen and tap icon. To reveal it tap icon. To export a track tap the icon at the bottom of the track details screen and choose the way to save your data. To delete a track tap the icon at the bottom of the track details screen. 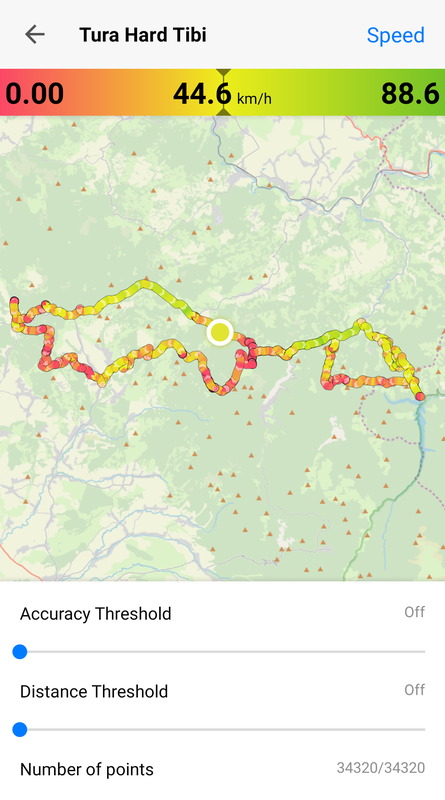 Note: filters settings influence the appearance of track on a map and size of track while exporting, but they do not affect the number of recorded points. Filter by the minimum accuracy of the received points. Points that are on the outside of the filter value will not be displayed in the track. Example: You are recording your GPS track while walking around your neighborhood and you have entered a supermarket. Tall walls, roofs and other obstructions can block the signal from GPS satellites and the device cannot determine your location accurately enough. You may enable the accuracy filter to hide GPS points if they are too far from your location. If the received signal has lower than the required accuracy, that points will not be displayed in the track. Filter by the minimum distance between points of a recorded track. Points that are closer than the distance specified in the filter will not be displayed in the track. Example: You are recording your GPS track while jogging, then you meet a friend and stop to talk to him. As the GPS sends location coordinates every second, too many points will be recorded on the same spot while you are talking and too many lines of a track will be drawn. You may enable the distance filter to hide GPS points if they are too close to each other and get rid of unnecessary lines. Note: you can change gradient to show speed or altitude during the route by tapping button in the upper right corner. The point on the track is related to the speed and altitude values. Collections are groups of bookmarks and GPS tracks, like folders on your desktop. Organising items into collections makes it easy to keep your travel itineraries separate from each other. To open My Collections list, tap the icon on the map. To create a new collection, tap the button at the bottom of the My Collections list. Enter details, then tap OK.
To view a set of bookmarks and GPS tracks within the collection, tap the collection name in a list. A-Z — items are sorted in alphabetical order. To search in the list tap the search field to reveal the onscreen keyboard and start typing. The list will dynamically display collections containing items that match your search criteria as you type. 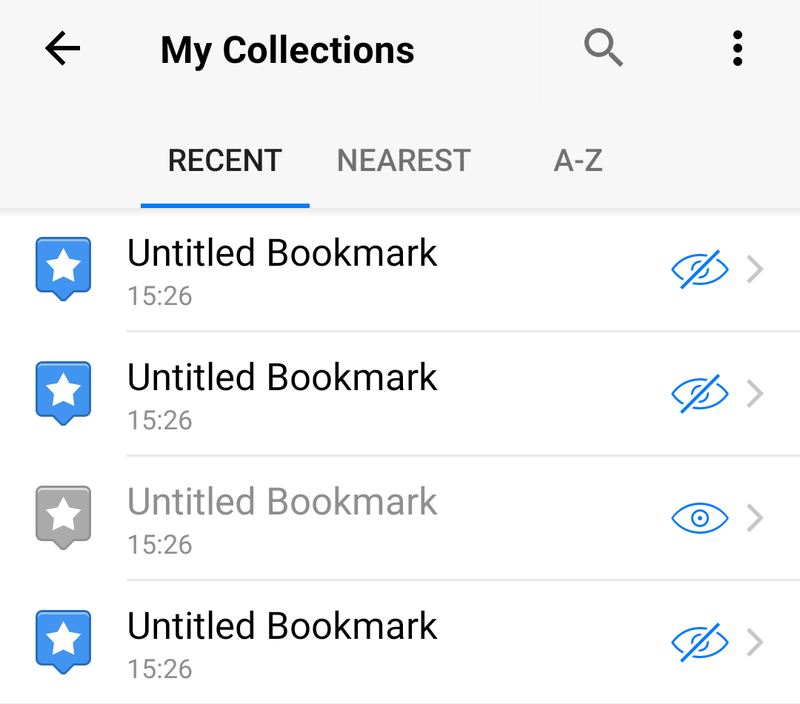 To delete from the list swipe left your finger horizontally across the collection, bookmark or track name you want to delete in My Collections list, then tap the Delete icon. To view collection details tap icon next to the name in the My Collections list. To edit collection name and description tap the name or description field and use the onscreen keyboard to type a new text. To set a collection as default move the Default Collection switch ON to save newly added bookmarks and GPS tracks to this collection. To select a parent collection in which this current collection is cataloged, tap My Collections cell. 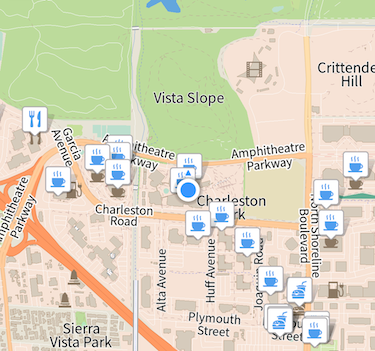 To view collection on the map tap the icon to open the map centered on the selected collection. 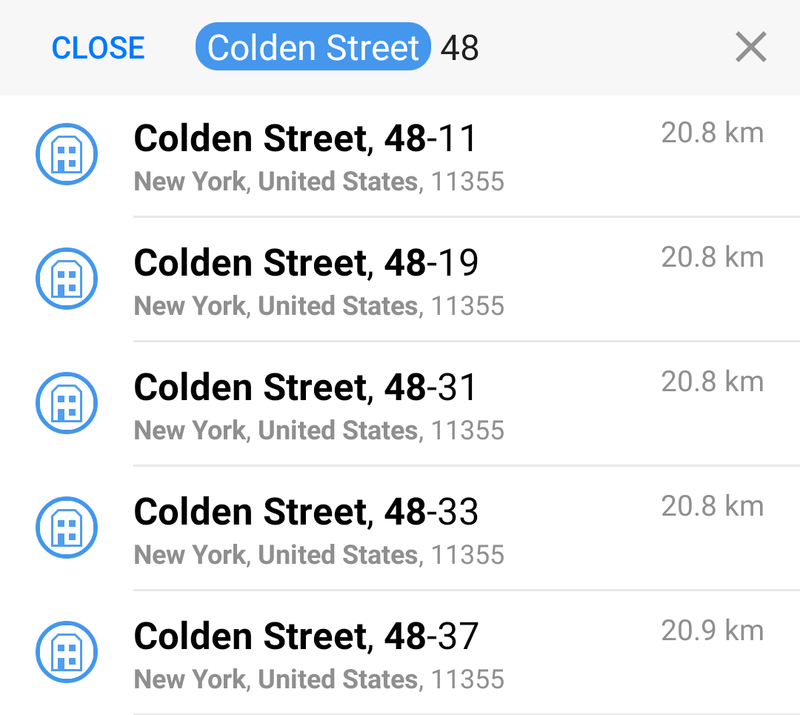 To show & hide collection from map, scroll down the collection details screen and tap the icon. To reveal it tap icon. To Export a collection tap the icon at the bottom of the collection details screen, choose the way to share your data.